For the two new AmeriCorps members hosted by Douglas County Partners for Student Success this school year, the motivation to help young students prepare for their futures has been shaped by personal experience. Hannah York, 20, was born and raised in Roseburg. Academics were top priority during her home-schooling, but when it came time to focus on life after graduation, York wasn’t sure where to turn for resources and guidance. Meanwhile Summer McDaniel, 23, grew up in a small town in Louisiana, where there were 12 people in her graduating class and few career options to explore. She earned a degree in clinical exercise physiology from Mississippi State in 2017 but still wasn’t sure which track to take. Now, both young women are starting out the school year in Douglas County hoping to help students consider their futures – and take the steps necessary for youth to achieve their goals, whether that means attending a university, finding a job in the trades or attending trade school or community college. Hannah York (left) and Summer McDaniel have joined DCPSS as AmeriCorps members helping students plan for their futures. “I’m hoping to give kids opportunities to receive guidance and access to resources, so they’re not floating out there not knowing what to do or where they’re going, spending unnecessary money and time on something they’re not quite sure is right for them,” York said. York and McDaniel’s AmeriCorps positions are called education-to-career navigators. The two will be serving youth who are exploring and immersed in experiences designed to engage them in personalized plans for future careers and education. Our partners offer a variety of projects to engage students in the process of planning for their futures, and York and McDaniel will be working at multiple levels. 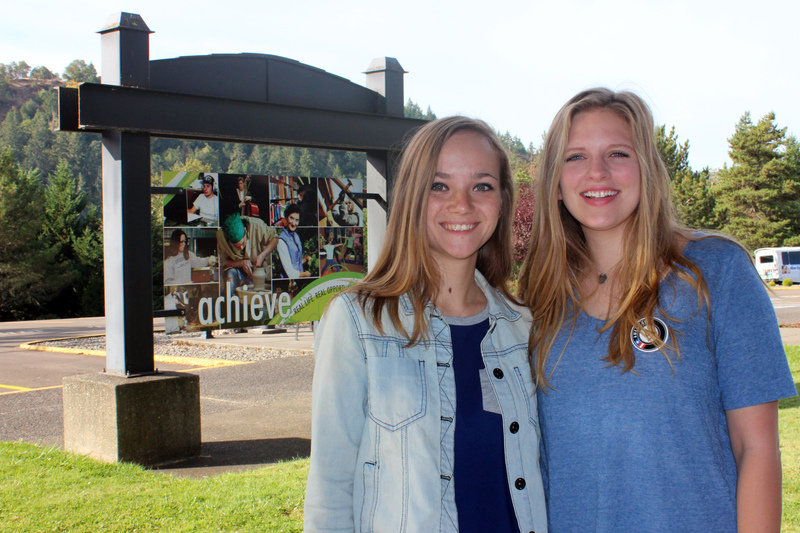 At the Boys & Girls Clubs of the Umpqua Valley, for example, the AmeriCorps members will work with students who use the College and Career Center, where youth can participate in programs such as Be Great By Eighth. The center is also a place where students can complete homework and fill out forms such as college applications, the FAFSA and scholarship applications. York and McDaniel will also help share information throughout the community about the Be Great By Eighth program, which works with at-risk priority middle school students to remove barriers to success while showing them pathways to bright futures. Other programs York and McDaniel will be assisting with include the BrightWorks career and technical clubs at Phoenix Charter School, and the Educational Talent Search (ETS) program at Umpqua Community College that focuses on underserved youth. BrightWorks clubs and ETS will also be located at high schools around the county. With the new school year just getting started, York and McDaniel have been spending their time introducing themselves, and getting to know some of the students they hope to help as programs begin to ramp up. “Our purpose is to get to know the youth, and for them to get to know us before we develop a mentor-mentee relationship,” McDaniel said. A large component of the work DCPSS does in the community revolves around honoring students’ voices – letting students tell us what they need to succeed. York and McDaniel hope that, as young adults themselves, they will be able help students open up to them about their aspirations for the future.